Find information on how to care for your plaster cast, or adjust your splint or brace. Following a trip to the hospital it is often difficult to remember everything the nurse or doctor told you about your broken bone, fracture or orthopaedic injury. 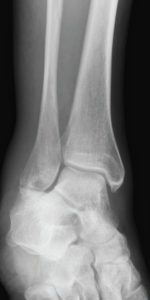 1.8 million fractures occur in England each year! We see a wide range of injuries over the complete age range from infancy to old age. Many different bones can be involved and the mechanisms of injury (how they happen) are many and varied. The range of treatment options is also wide. Because of this, non-complex fractures present an enormous challenge to the NHS. Many fractures get better with very little medical assistance. But healthcare can overcomplicate matters, with unnecessary time and effort being expended on fractures that are likely to get better without treatment. However, some non-complex fractures can appear minor and be easily missed, but have the potential for a poor long-term outcome. So there is a need to achieve a balance between making sure that injuries needing treatment are not missed and treatment is avoided for injuries that are likely to get better on their own. "We hope that this website helps you recover well from your injury." It is important to note that every injury is different and the information provided here does not replace of alter the advice you have been given by the team treating your injury. We aways recommend that you seek professional advice. We hope you have found our website useful and information. If we have missed any important information or you have a question then please do get in touch. Equally if you have something positive to say please drop us a note.